Why should you talk to us about your digital marketing? We at Foxxweb believe in making it clear what you are paying for. So many of our clients say to us something along the lines of "I used to pay £'s to my SEO agency, but I never knew what they really did!" With us, we will start with an audit of your current situation and determine what you want to achieve. Then we will agree a clear programme of actions that suit your budget and business objectives through one of three easy-to-understand packages. With regular reviews built in, you can understand what you are buying. And, of course, you will see the results in more enquiries and sales from your website. Click here to review our detailed service packages. Foxxweb is a specialist digital marketing agency that helps businesses in Derby and Nottinghamshire to get found on the web. Designing and building an effective website is just the first step in promoting your company online. 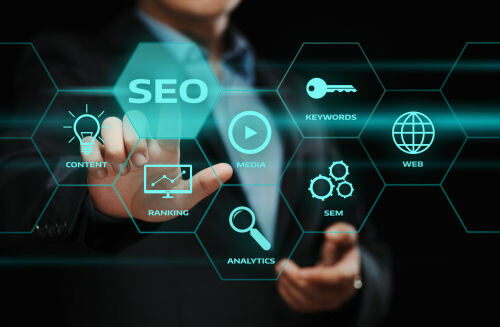 Without an SEO strategy and digital marketing activities to back it up, chances are that you won't appear in those crucial top spots in the search results. Your only other option would then be to revert to expensive on line advertising. We can help you get your SEO strategy sorted to achieve this. We set a baseline for our work by performing a thorough analysis of how efficiently your website is working. That includes performance on a mobile, how it ranks for your keywords (and identifying if they are the right ones), searching for broken or missing links, and how thoroughly each page has been set up. When did you last check your site for spelling/grammatical errors and omissions? Is your call to action clear? When was your last blog? Does the text of each page contain the nominated keywords at the right density? We can do all this for you. A series of measurable metrics that allow you to keep track of the performance of your digital marketing are included with every package and go further than just Google Analytics. This is the best way of checking your site's "authority"; that is, how useful and important Google thinks it is. We work to get backlinks to your site from reputable and popular websites. This is not something we can be achieve overnight, but it is very effective. We will create engaging and interesting content for your website to help attract and keep visitors. A good blog can provide material for social media posts and position you as an authority in your market. It's not rocket science, but it does take time and skill to get right. And the rules keep changing; Google, for example, updates its algorithms every day, with major changes to search results two or three times a year. A specialist digital marketing company such as Foxxweb knows when these changes will take effect and can help you stay one step ahead of your competitors. Having an SEO-friendly website - this is the 'behind the scenes' bit, working on the way the site is set up, tagging, structure and keywords for every page. On-page content - using keywords and content to make your site pages relevant and informative to people searching for you. Improving your website's authority - we do this by backlinking from other reputable websites, increasing your local-search presence and optimising your reviews. "We're very impressed with the SEO work undertaken by Foxxweb - as well as fixing a number of optimisation essentials for the website, the long-term link-building work is really paying dividends with a doubling of sales on our ecommerce site over 12 months. We now typically have first page results for the majority of our products and often we're at the top of the first page. John's candid style directs you away from unnecessary expenditure and only recommends website improvements that will provide the most effective return on your investment." Foxxweb Design Limited is a company registered in England and Wales, Reg No. 09187790 Registered Office : 7 St John Street, Mansfield, Nottinghamshire, NG18 1QH.